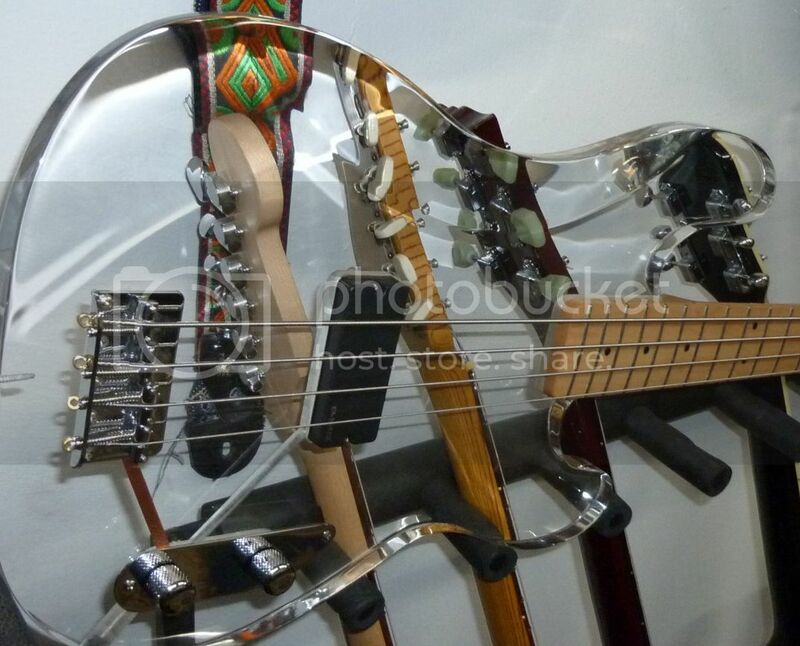 Here at Guitarz we don't just celebrate only vintage guitars, we also take an interest in contemporary instruments. Katar Kustom Kuitars (their spelling!) 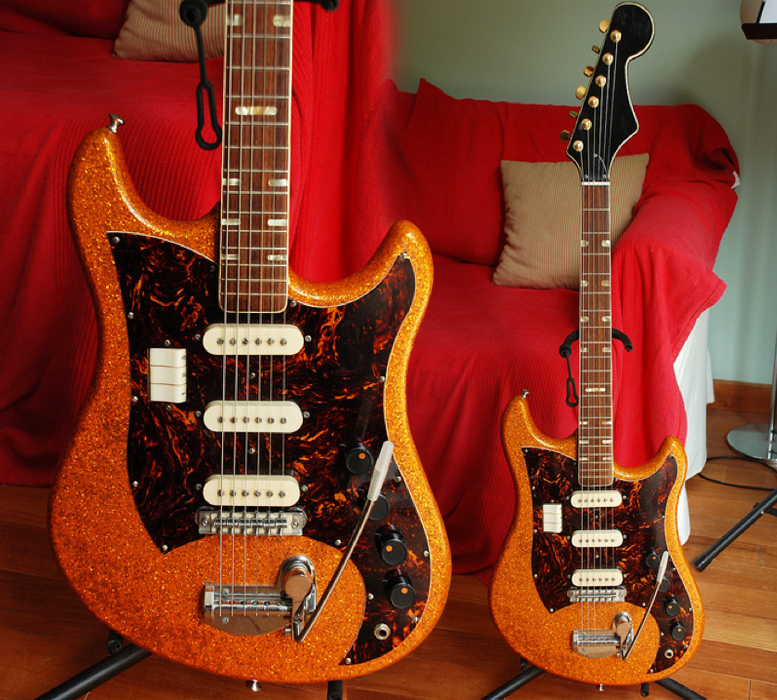 are a boutique maker from Finland specializing in Custom Shop instruments. 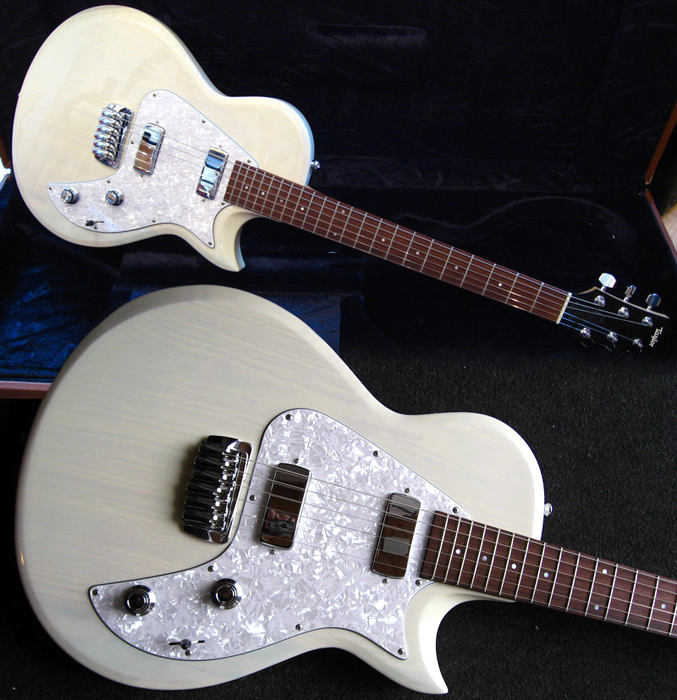 As well as guitars obviously styled after certain famous Fender and Gibson models, Katar also offer some original designs such as the Popmaster which is delightfully retro in its design having the vibe of some of those old Danelectro and Kay guitars, but obviously with much higher production values. 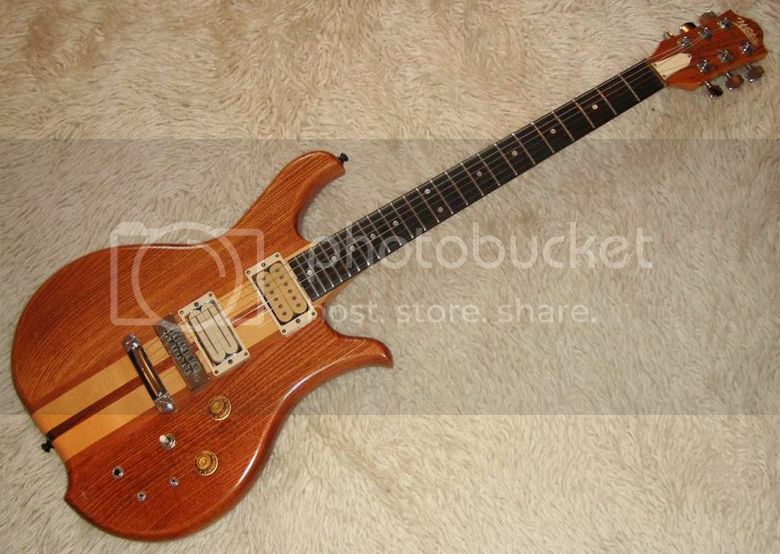 This particular guitar is being sold by Amplisonic Ltd of Finland via Vintage & Rare and is priced at €3800. Of all the doublenecks ever produced, those made by Gibson must be the most easily recognized (no doubt helped in no small part by Jimmy Page), but they didn't just produce 12-string/6-sting and bass/6-string combinations. 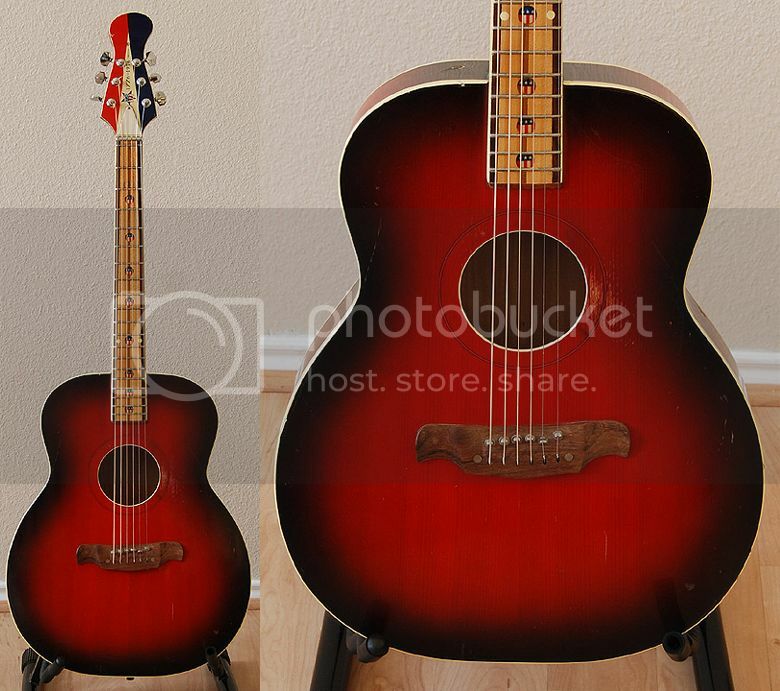 Here we see a super rare Gibson EMS-1235 doubleneck that pairs together a 4-string tenor guitar with a mandolin. It would appear to be a custom order, handmade by master craftsman William Westman in 1967. Note the pickups which are full 6-string sized but only have 4 polepieces. Currently listed on eBay with a Buy It Now price of $12,995. 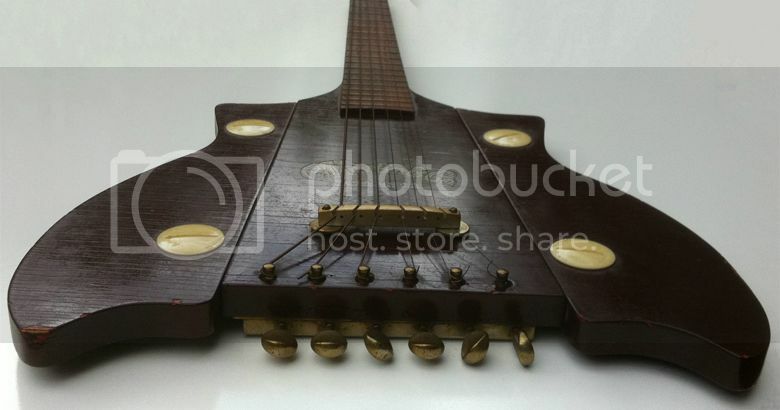 Also, see here for another unusual Gibson doubleneck. What's that guitar that Tom Cullinan from Quickspace is playing? 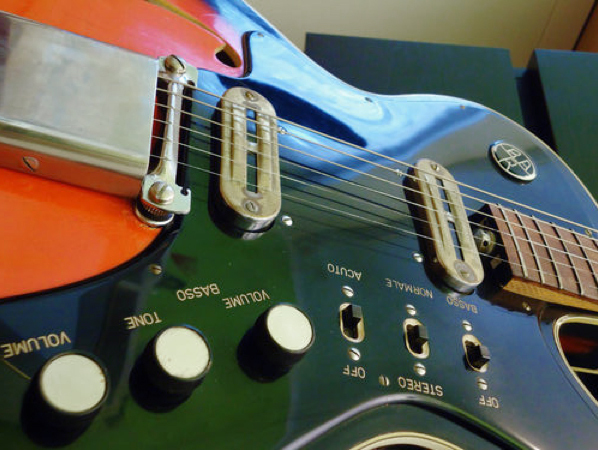 Hey, I've been following your guitar blog for a long time now and it is great. I check it every day. 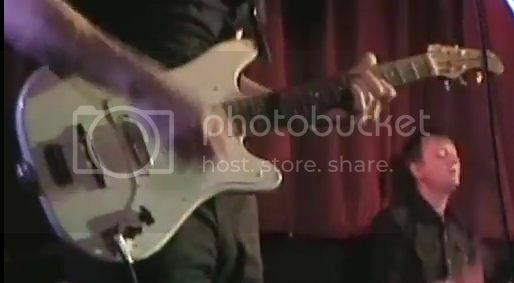 I was wondering since you seems like an expert in guitar identification, if you can tell me what guitar is pictured in the attached image? It' the guitar played by Tom Cullinan who played in a band called Quickspace. I've been trying to figure it out for ages. Sorry I couldn't get a better picture. Hi James, it looks to be a Vox Clubman. 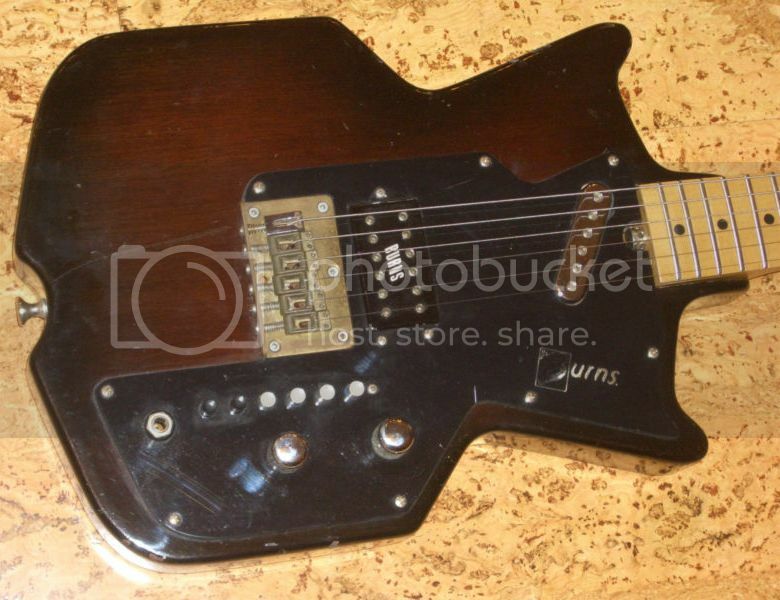 This would be an early 1960s, Made in Dartford, Kent, UK, Jennings Musical Industries (JMI) Vox, before guitar production was outsourced to the Eko factory in Italy. 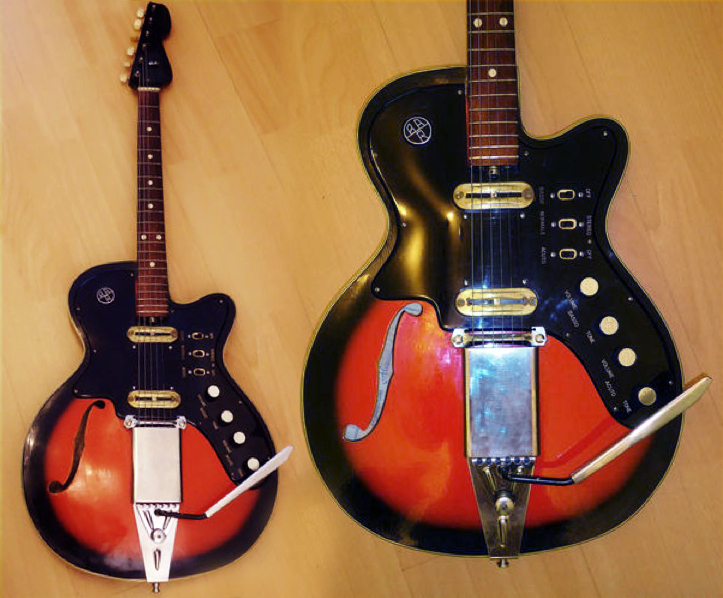 If it is anything like the Vox Clubman II that I used to own (the II had a different body shape), then it's a very basic student model with a very thin (approx 1" thick) plywood body, and non-adjustable trussrod in the neck (basically just a neck with a steel bar beneath the fingerboard). 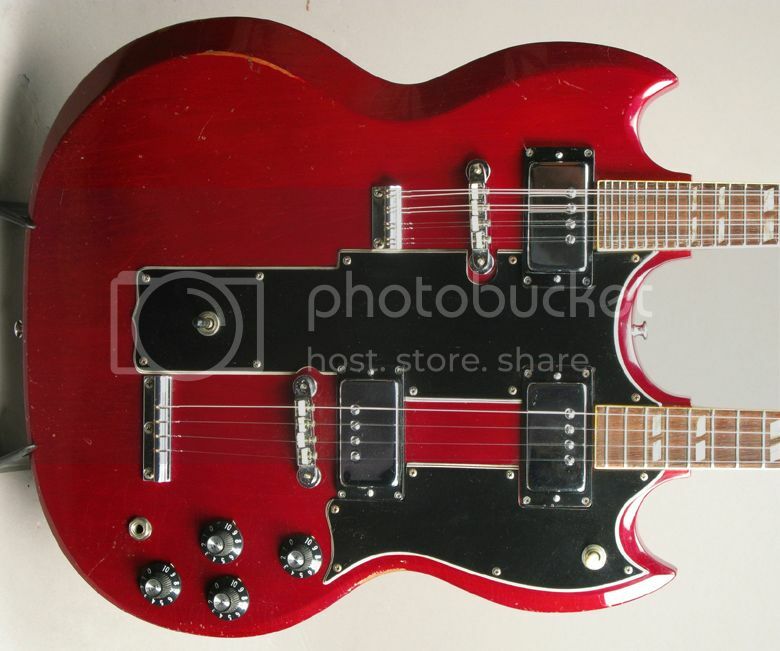 From the picture you have supplied, it looks like this example has been modified with tuners moved to both sides of what was once a 6-in-a-line headstock. 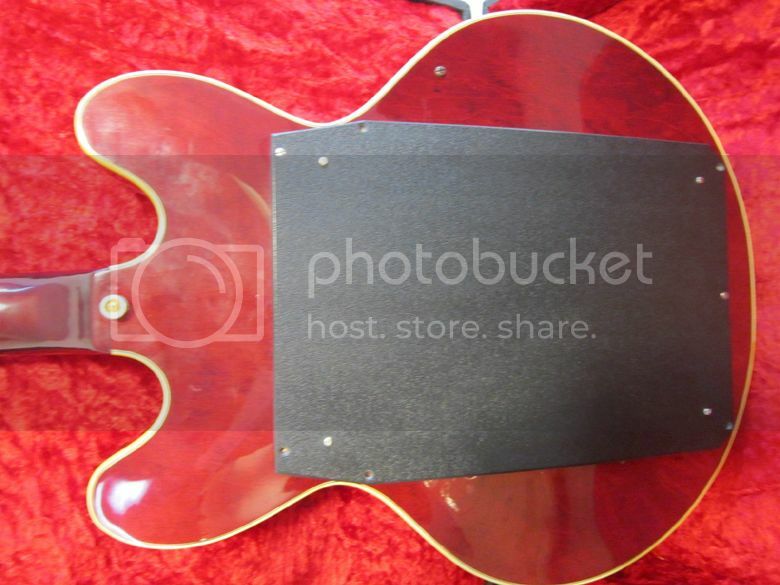 Labels: British guitars, vintage guitars, Vox, What's that guitar? guitarz.blogspot.com: Another fine clip from last night's Later... with Jools Holland. guitarz.blogspot.com: Whilst I confess that I'm not really a fan of Muse, I have to admit that they do use some very interesting instruments. Frontman Matt Bellamy is of course known for sometimes using a guitar with on-board Kaoss pad which he uses to control various effects. In this clip from Later... with Jools Holland, broadcast live last night on BBC2 in the UK, we see Christopher Wolstenholme playing a doubleneck bass guitar/Misa Kitara. Those of a nervous disposition, or recovering from a hangover, may want to reach for the sunglasses. I'm sure the rather OTT limeburst finish on this Limited Edition 2012 Custom Shop Les Paul Junior won't be to everyone's tastes. 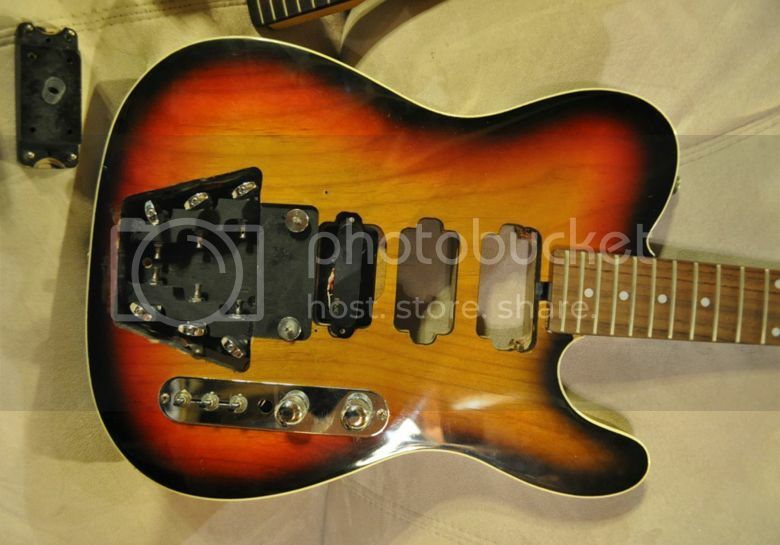 For myself, I'm more shocked that such a basic design of guitar is being offered here with a $2,990 Buy It Now price tag. 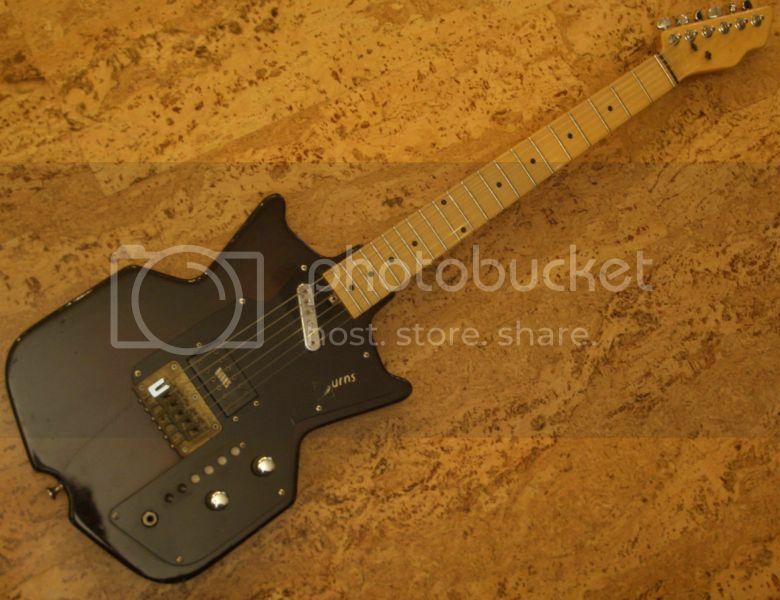 Vintage & Rare Guitar of the Week: Schwarz Custom Guitars Supercharger "Little Charlie"
It's funny how a little twist on an established design can sometimes give it a lease of new life. 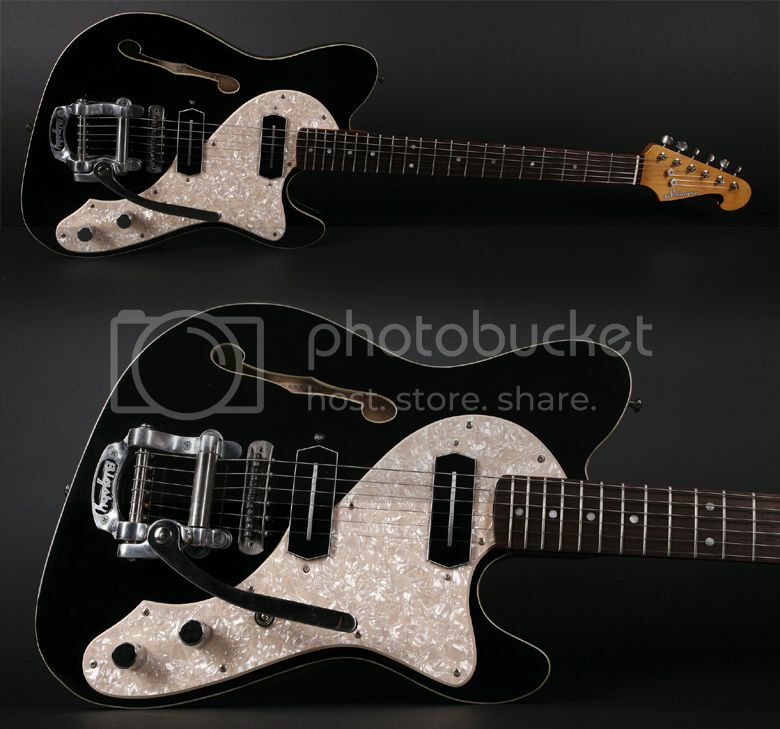 From Germany, this Schwarz Custom Guitars Supercharger "Little Charlie" model takes a Bigsby-equipped Telecaster Thinline and gives it the offset waist treatment. Design-wise it works beautifully; you have to question why no-one thought of it before. (Or perhaps they did... observations on this matter in the comments please!) The guitar also features a pair of Charlie Christian style pickups, which I'd imagine are the reason for its "Little Charlie" nickname. Priced at €2390 and available via Vintage & Rare. See www.schwarz-custom.de and/or www.gitarren-studio-neustadt.de for further information. It's not clear if the Kosmos was released before or after the 1982 Moderne limited reissue (or first issue, it depends on if the 3 Modernes built in 1958 and lost since can be considered as a first edition) - information I could find are contradictory, but if they were pre-1982 they are the first real incarnation in the real world of this cool design! If they were post-1982, since there was no chance for a 1980s eastern-european musician to put his hands on a Gibson limited edition, copying it was no real infringement, more an homage! And the Kosmos was a really successful model amongst communist metalheads! Before MIDI guitars, before guitar synthesisers even, back in the 1960s there was the guitar organ. Basically these consisted of the guts of an electric organ, stuffed into the body of an electric guitar. 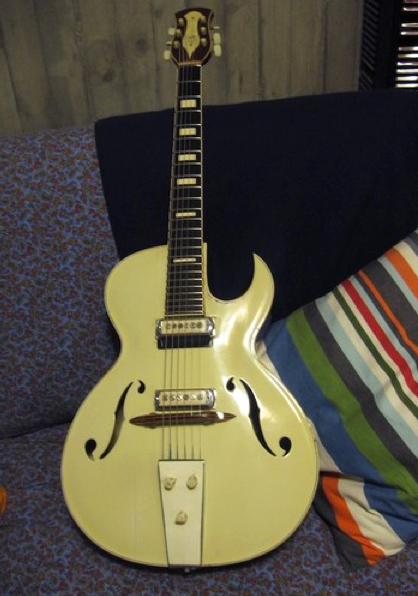 Hollow-bodied electric guitars were popularly used, such as this attractive Gibson-esque semi, the MCI electric guitorgan. Other than all the extra switches on the front of the guitar and the blocked off f-holes, the other main giveaway to the extra electronics inside the body of the guitar is the large access plate on the rear. Note the split frets - these were actually the triggers for the internal organ sounds - when the string makes contact with the portion of the fret, a simple switch is triggered to play the correct note. Just think of the amount of wiring there must be beneath the fingerboard. 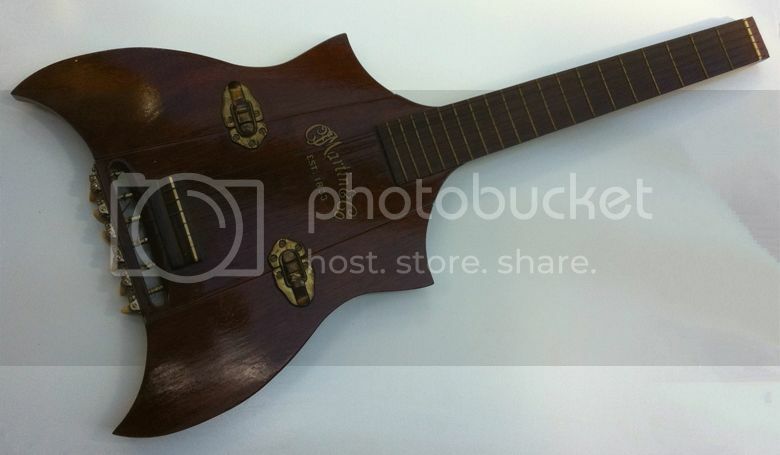 This particular guitorgan is not only in working condition, but was also modified for MIDI in the 1980s and so could be hooked up to MIDI synths. It's currently listed on eBay with a Buy It Now price of $2,850. I love crazy guitars with original designs and creative spirit, but I also enjoy no-nonsense simple ones like this Taylor Classic SB1-X with its sober but very elegant line and finish (transparent white is one of my favorite, look at this!) I love the pointy cutaway - it looks like a giant shark tooth, a sharp detail of an otherwise sensually curved outline ! 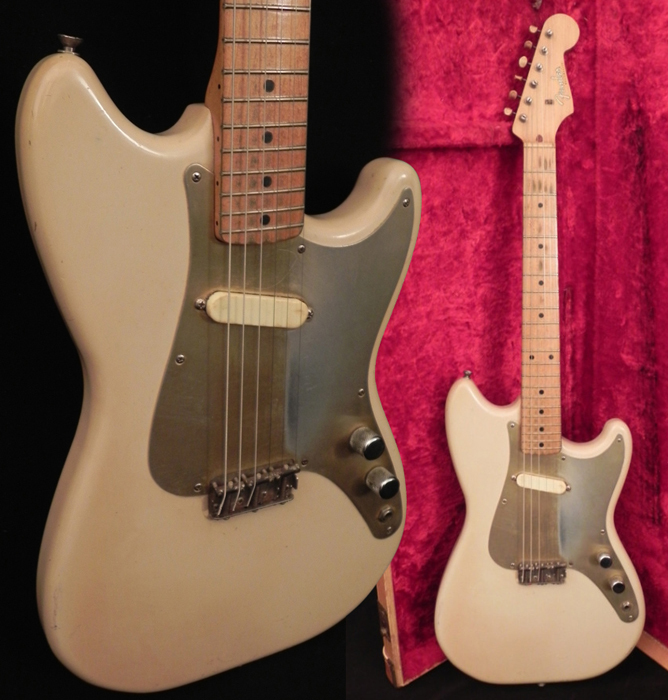 I should really have posted this Vintage & Rare Guitar of the Week a couple of days ago, but as ever, other things came up and before I knew it, it was next week already! Anyway, here we have an acrylic-bodied Precision-style bass from Finnish Guitar Works (FGW). 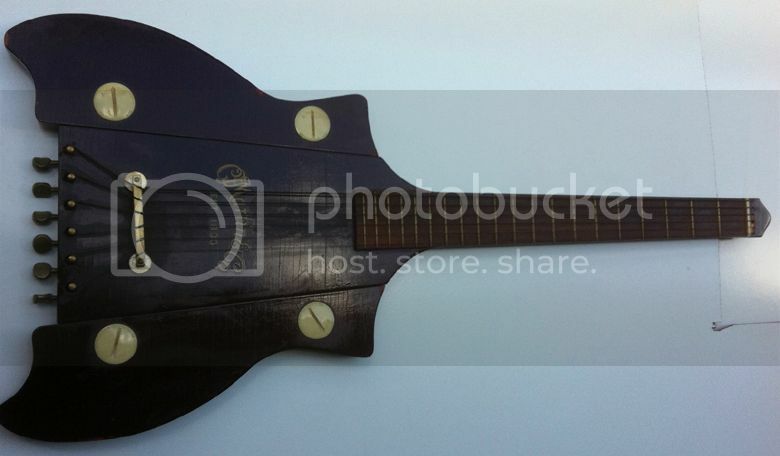 I don't think we've had the occasion to feature a Finnish-made instrument on the blog before. The slab-bodied Precision design with its single pickup and simple contol layout makes for an ideal instrument to receive the see-through perspex body treatment, as there is not a lot of internal routing to be seen. 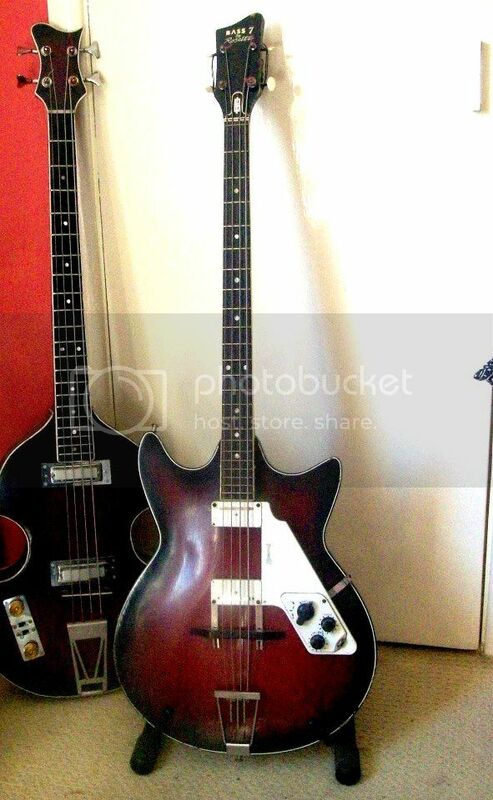 This bass is currently being offered for sale via Vintage & Rare, priced at €890. 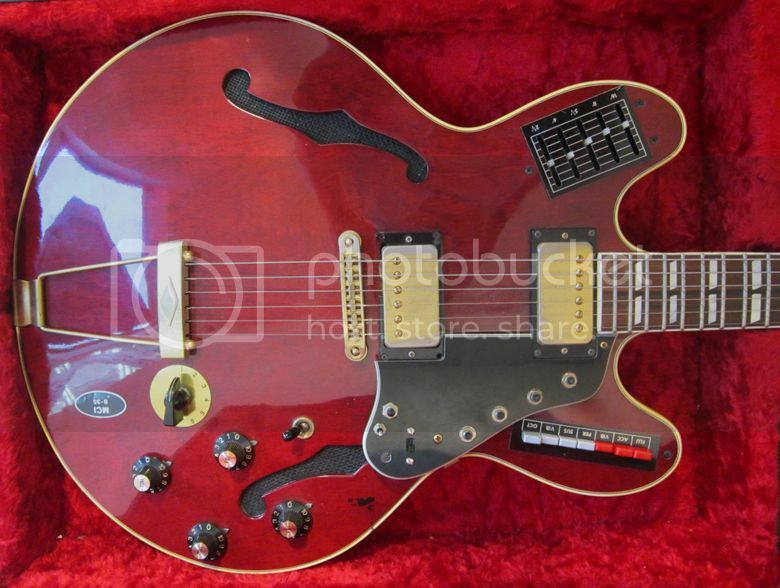 Labels: cool guitars, Framus, German guitars, vintage guitars, What's that guitar? 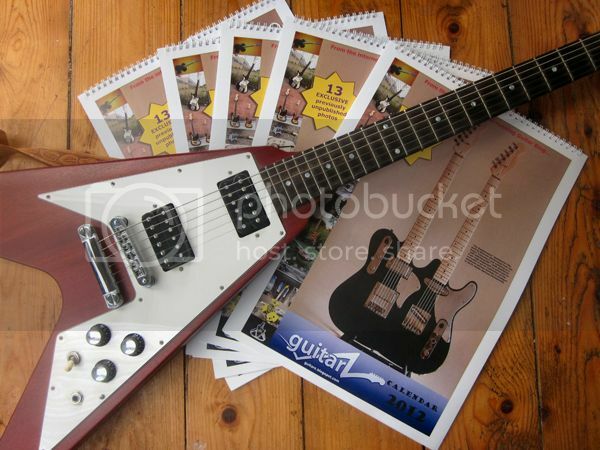 This time last year we were busily putting together the Guitarz 2012 calendar (as pictured here). Because of a distinct lack of finances, until very recently I had thought that we wouldn't be able to produce another for 2013, however we now have a plan to go ahead with a 2013 calendar after all! 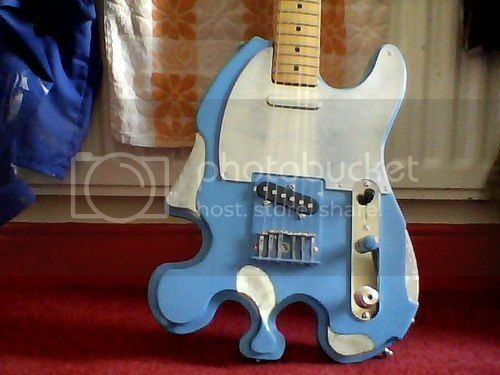 So, we are now wanting photograph submissions of YOUR unusual guitars - the stranger the better! Please no ordinary Strats, Teles, Les Pauls, etc - we all know what they look like already - they'll need to be really interesting customisations or variants if we are to feature any of these! Photos should be high resolution, and should feature the whole length of the guitar face-on (so no chopped off headstocks please). From having compiled the Guitarz 2012 Calendar, I found out the hard way that landscape-orientated photographs fit the page a lot better than portrait pictures, so landscape pictures would be preferred. Please keep backgrounds either neutral - and uncluttered - or else photograph the guitar in an interesting setting - but the focus of the photograph MUST be the guitar itself. Please avoid clutter and any extraneous objects - photographs should be composed artfully. Please no guitars laid on a bedsheet. Obviously as it's for a calendar, we can only use 12 photos - one for each month - plus another photo for the cover, so we will choose from the best pictures submitted. Sorry, it will not be possible to use every submission but perhaps some can make it onto the pages of the blog itself. © 2011, Guitarz - The Original Guitar Blog - 10 years and counting! These are 2 of 5, custom made by Martin employee John Huber, for himself and other Martin employees for business travel. 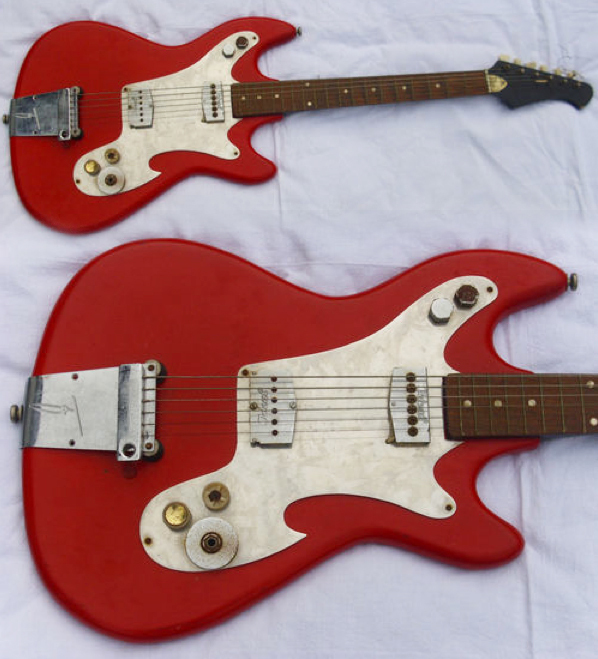 Purchased, by a collector, at the Martin Factory between 1965 and 1976, these guitars have been display pieces and not used instrumentally since. Both are solid folding body of 3/4" unknown wood species. They do not have electronics. Bridge and saddle work appear solid, however the "action" is not suitable for comfortable playing. [...] These models have been authenticated in 2010 by Martin employee Mike Dickinson, Exotic Guitars. Appraised at $500 to $750 each. 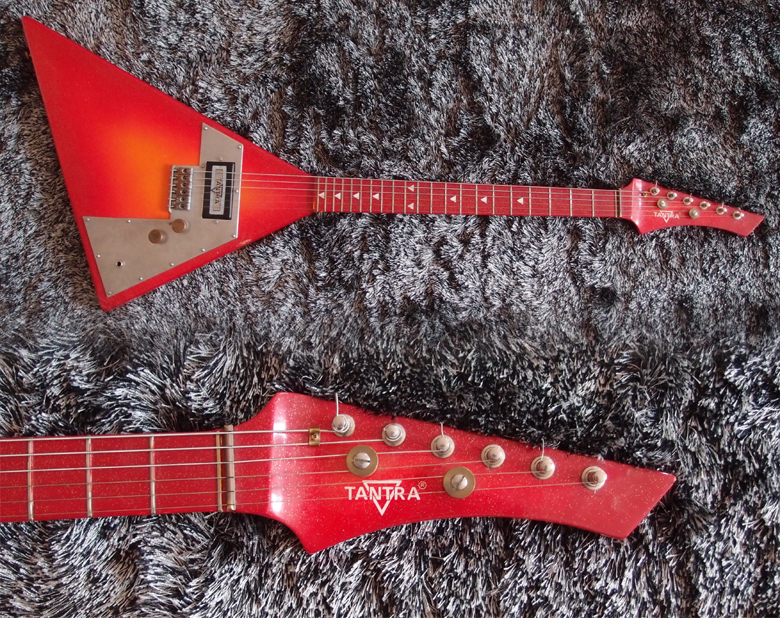 Note how the central body section, if you were to remove the detachable body wings, would make the guitars appear very similar in appearance to the legendary Steinberger design. But as guitars with no acoustic soundbox, nor electrics for amplification, I can only assume that these guitars were intended for quiet practice. I just cannot imagine what was going through the mind of the perpetrator of this eccentric piece of customisation. 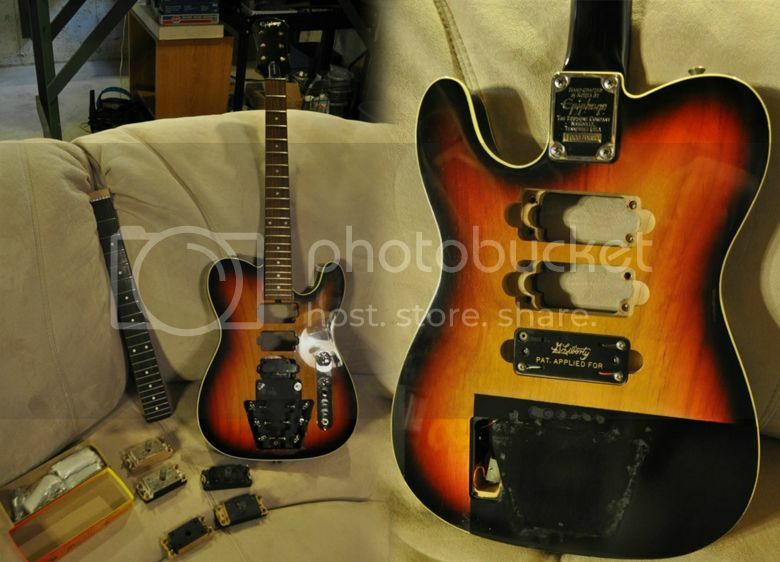 Fender fans may take some solace in the fact that it is not a genuine Fender Telecaster, although allegedly some of the parts are Fender-made (that could just be the control knobs for all I can tell). Currently being offered for sale on eBay UK with a highly optimistic Buy It Now price of £390. Thanks to Dan who brought this abomination to my attention on Twitter. I'm KAMEL CHENAOUY, French luthier. 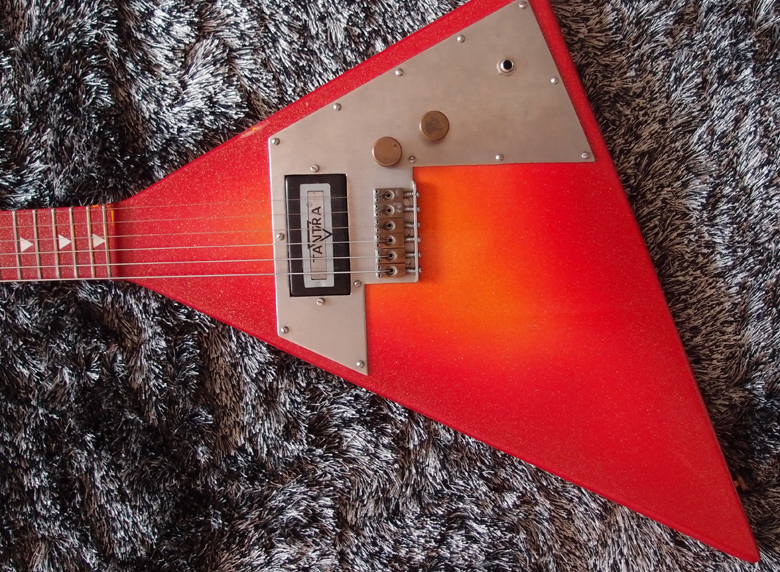 I designed this guitar in 1978 (the guitar shown on the blog is a copy). It's true, it is an inspiration between BC-Rich (who was a very close friend) and Alembic. I was the french importer of these 2 brands, and it was the trend of the thruneck at that time. The original ones (mine) including bass model were made in Japan. I have put on the french market this design during less than 2 years under my brand: APEX GUITARS, and anyway before begining of the 80s. It was just a transition guitar because it was not really corresponding to my way of design. In fact, I had already my own original models, and because the demand was very high, I could not follow it. So, I stopped everything, put on the market this design just to keep my brand in the people mind and during that time, I re-designed my original models and increased the line by new models, then I made the protos and gave to Kasuga (Fernandes) which had the production capacity. few months after, I started the distribution of my new line and stopped the model you show here. With Kasuga production capacity, I was able to sell about 200 units per month. Life duration on the market was about 12 years and more than 8000 pcs were sold. My guitars were famous and today many collectors are addicts of them. The most successful model was the PROGRAM 2000 a futuristic design including a memory, a personal invention which I started the study in 1978 and patented after, and then exibited on the market in 1980. I'm still designing guitars and still building orginal guitars. Hope this info is useful for the blog. I confess I'm still a little unclear about where "Wotan" comes into the picture; where he says the pictured guitar is a "copy" does that mean it's a copy of his design, or is he referring to his own design as a "copy" because it's Japanese-made. Sorry, I got a little confused there? (Anyone make better sense of it? Maybe I'm having a slow day.) Nevertheless it's good to hear from the original designer. Very little is known about he Bartolini brand - they usually sport the BAR brand you can see here, that stands for Bartolini (or Bartoli, I found the two versions, but Bartolini is more likely) Alvaro (some say it's the first name of Bartolini, some that it's an associate) Recanati (being the Italian town where the company was created - same town that saw the birth of most famous Italian guitar brand Eko). But as often in the 1960s, you could find the Bartolini guitars under several brands, such as Baronet, Soprani, Dega or Diamond, depending on the country or even just the Italian city where they were distributed. 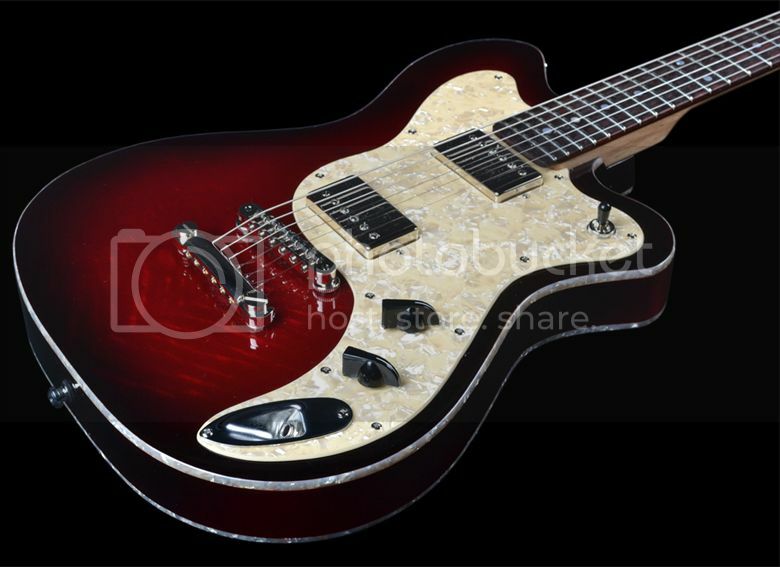 Though this thinline guitar's design isn't as inspired as Bartolini's solid bodies, it shares one of their specificity: the big pickguard that covers almost half the body and follows the outline of the guitar - I love that on a hollow-body. I enjoy also a lot the armour-plated tremolo - almost German in its intensity - and though it lacks the big plastic switches adorning its solid body siblings, it has the typically Italian complex electronics. Can any one shed a little light on this Bass 7 by Rosetti made by Egmond? My friend found it at the back of a garage while cleaning it out, I've tried but have had little result in finding out much about it, so now I am asking the experts. Well, we're not really experts, just enthusiasts and we are learning more and more about guitars every day. 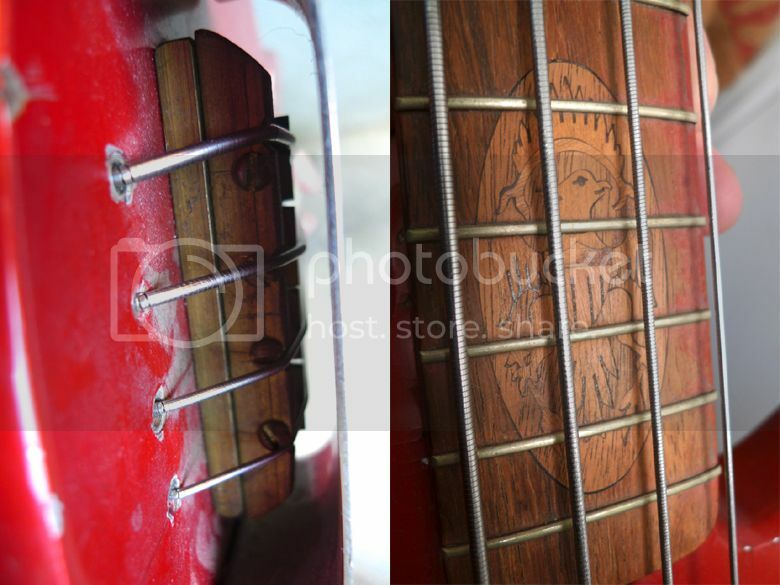 You have already correctly identified the bass as an Egmond Bass 7 despite the Rosetti brandname. Rosetti were - and still are - a UK-based musical instrument distributor. The Egmond Bass 7 dates (at least as far back) to 1961 when Egmond opened their new factory in Best, The Netherlands. It was part of Egmond's "7" series which also included the Lucky 7 and Solid 7 guitars. 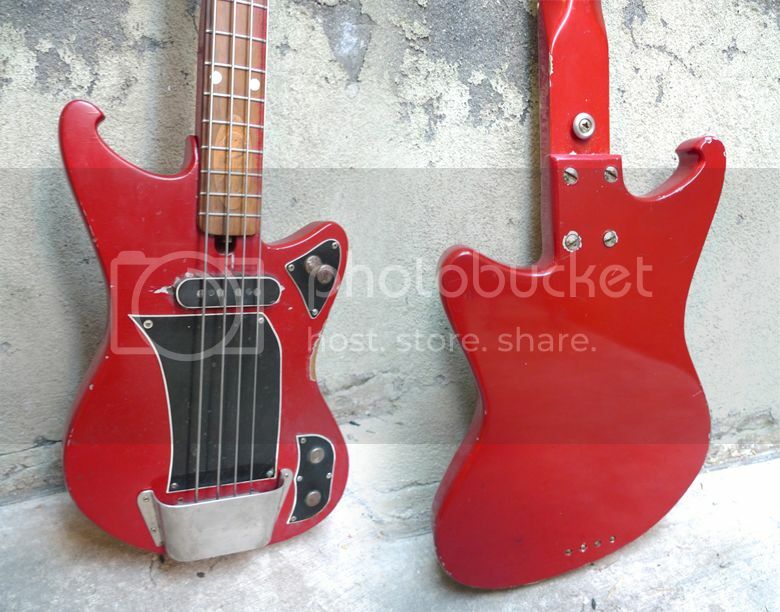 In fact, the Bass 7 could be considered the bass version of the Solid 7. Paul McCartney's first "bass" was actually an Egmond Solid 7 guitar strung with piano strings - maybe he didn't realise that they actually produced the Bass 7. (Speaking of Paul McCartney, we notice that the bass in the photo has also been strung for a left-handed player). Despite the "Solid" name, all these guitars were actually hollow-bodied, but with only the Lucky 7 having f-holes to indicate its hollow-body status. Furthermore, these instruments did not have truss rods so any movement or twisting of the neck would be difficult to correct. This may well be part of the reason we don't see so many of these Egmonds these days - if the neck twisted or bowed it would be useless and the guitar may well end up being binned. For further information please see www.egmondguitars.nl and www.egmond.se - I sometimes wonder what we would do for information if it wasn't for fan sites like these! Whoops! It seems I've not featured any Vintage & Rare guitars recently - this is not a deliberate oversight, rather it's just a case of me having been very busy and often not posting on the blog until last thing at night and - dare I say it - without having had the time to put in the research. So apologies to our friends at Vintage & Rare - we haven't forgotten you! 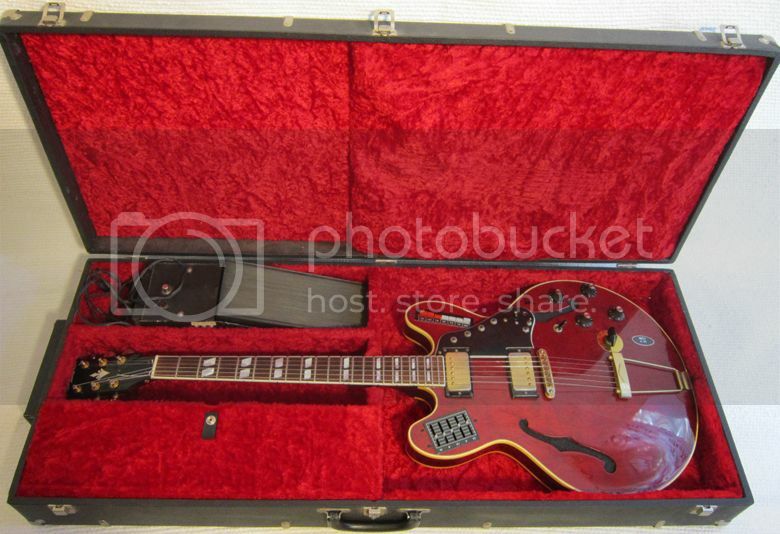 Although it looks like a Gretsch Roundup, this particular beauty - a 1956 Gretsch model 6129 - is believed to be the original Chet Arkins guitar before Gretsch developed his own signature model. 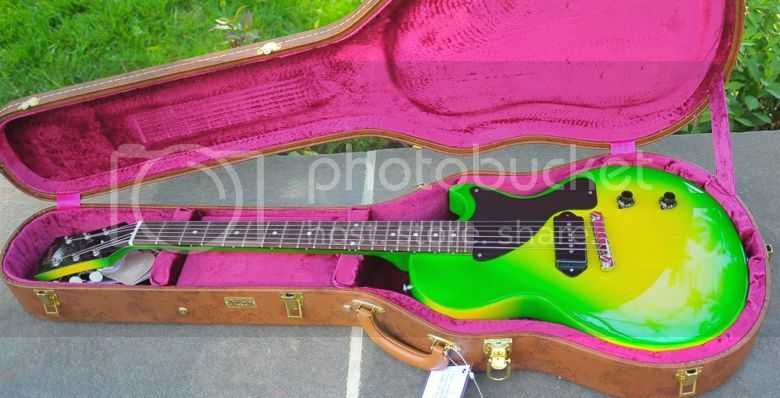 It is being offered for sale by The Guitar Doctor via Vintage & Rare. 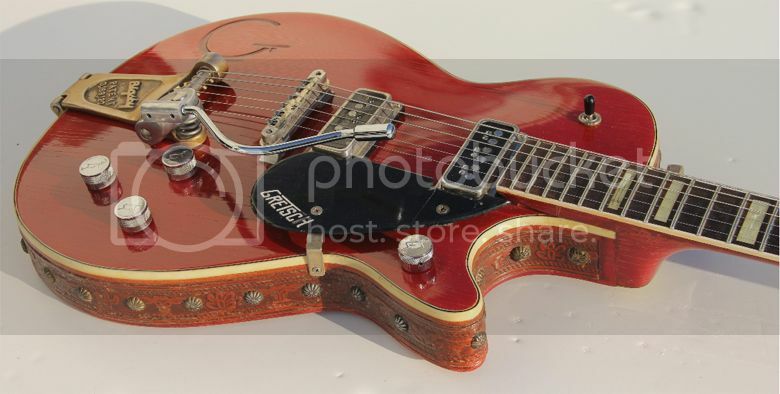 Note the studded leather trim around the sides of the body; on many guitars it could look tacky, but on this Gretsch it looks quite natural and "appropriate". 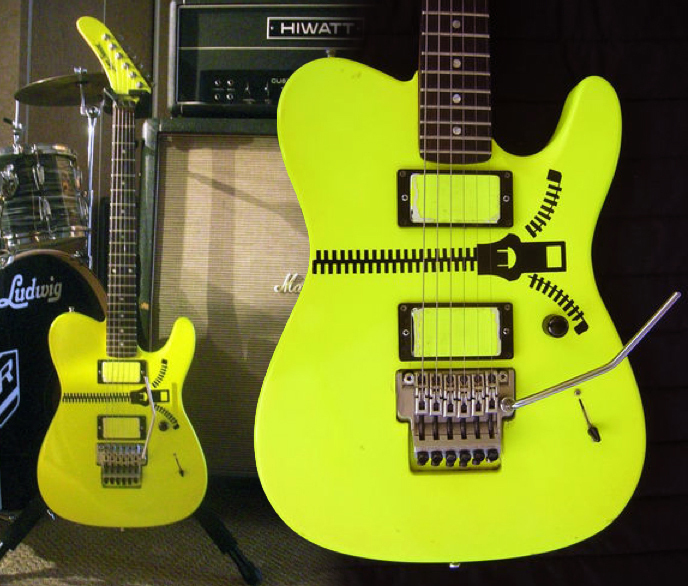 OK so we acknowledge that the 1980s produced angular and geometrical guitars, but it also saw the birth of the superstrat - and of the more anecdotical super-telecaster such as this very yellow one-off by James Trussart, who was not by then the renowned creator of rusted steel bodied guitars he became later. Like a superstrat it has EMG pickups, no tone knob, a Floyd Rose trem and a reverse banana headstock - and its flashy color must have been perfect to play Tennis-Wristband Metal - the latest and worst avatar of Glam Metal . This is a very very rare model. We only made 5 of those. The fretboard is painted (though being in purple heart) there are sparkles in the varnish and it's kind of "basic sunburst". The pickup is the first generation we made, single coil with a grey touch in the middle. So I can assure that this guitar is one of the very first ones of our production (1981). 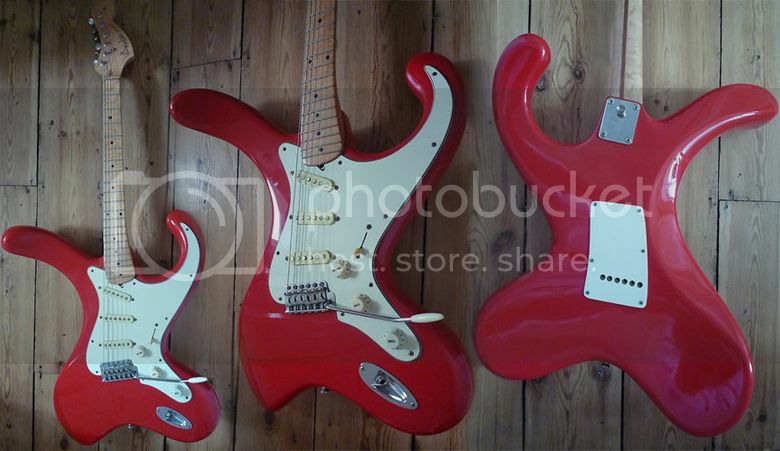 The latter models had two single coils in the same box you could switch either in parralel or series, in or out of phase for humbucking or "Dire Straits" type of sound (but the real big sound was in parallel), the fretboard was natural and had round dots and wider frets. By the way Hamsa means "swan" in Sanskrit; it's the shape of this bird that inspired this guitar. Concerning the price I really have no idea. If it still plays well I'd say 1500 € because of the rarity, maybe more for a real collector. 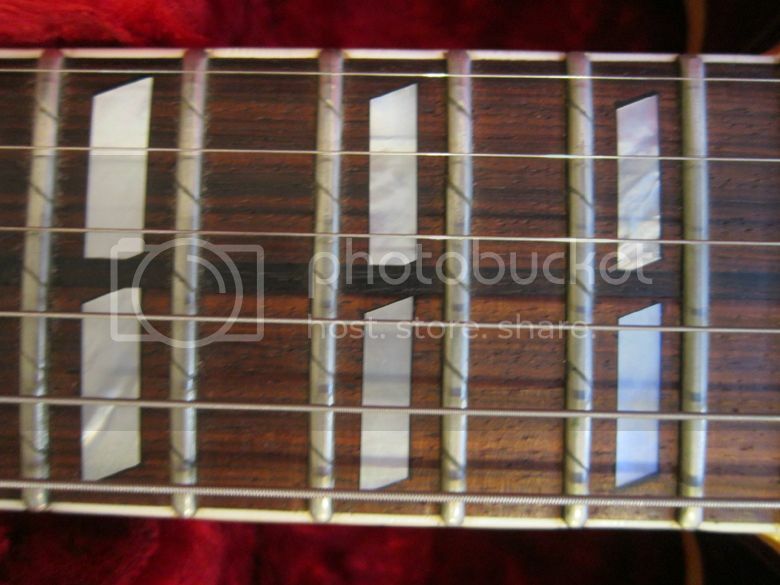 We stopped making "painted" fretboards because it was really fragile on the edges. There were also two types of wood used. Without looking under the pickguard, you can tell by the weight; if the insrument is really stiff and rather heavy it's made from oak, if it's lighter and you can slightly bow the neck, it's made from mahogany. Hope you have all the answers you need. I'd like to thank Hervé for supplying the above information, and also Maxime for showing us these photos of this rare guitar. The Burns Bandit is a model that I was previously unaware of. 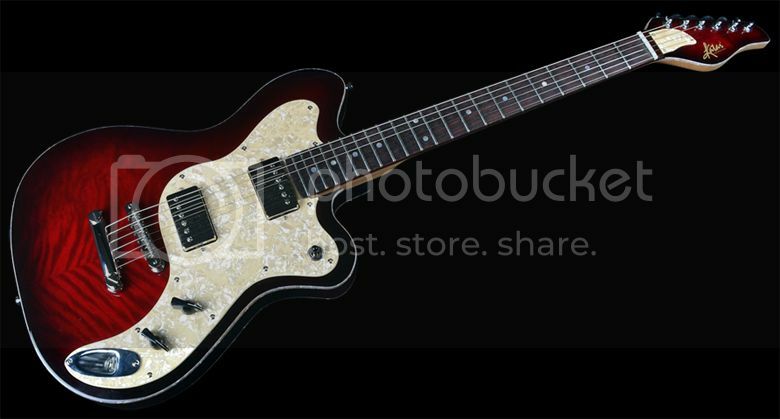 According to Burns Guitar Museum website the Bandit is from the 1980s and the general design and pushbutton selector switches would seem to support this. 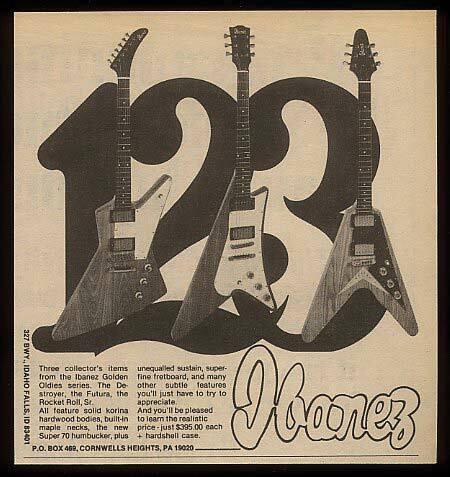 As such it would be a product of Jim Burns Actualizers Ltd, one of many guitar-making companies associated with Jim Burns and the Burns name. 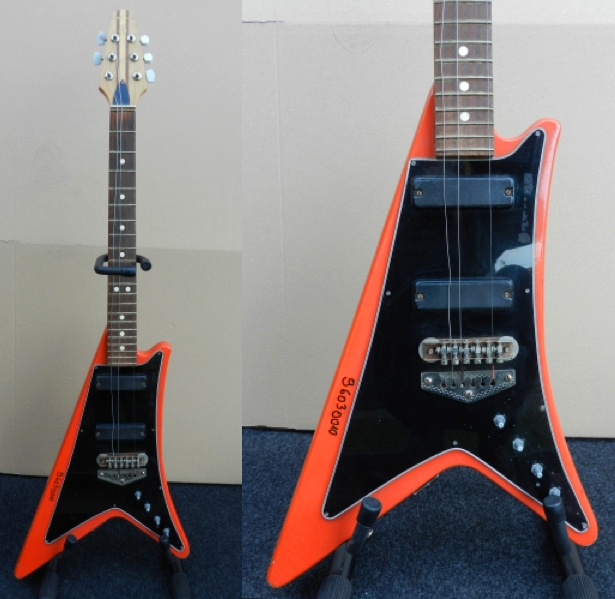 Jim Burns Actualizers Ltd lasted a mere four years from 1979 to 1983 and produced guitars such as the Steer and the Scorpion. This example is currently being auctioned on eBay from a seller based in Indianapolis, and has a low low starting price, so it'll be interesting to see what it sells for. In this time of celebrations, what's better than a vintage psychedelic Japanese imitation of an Italian guitar, such as with happy Norma? Because that's what Norma used to do, building Eko inspired guitars in Japan and releasing them on the US market in the late 1960s - not only Fender and Gibson are worth copying! Just watching this guitar fills me with love and peace and makes me want to hit the road in a Volkswagen kombi custom-painted with flowers and peace symbols! We don't normally associate Mosrite with acoustic guitars, but this Mosrite Bicentennial edition from 1976 proves that they did indeed produce such guitars. 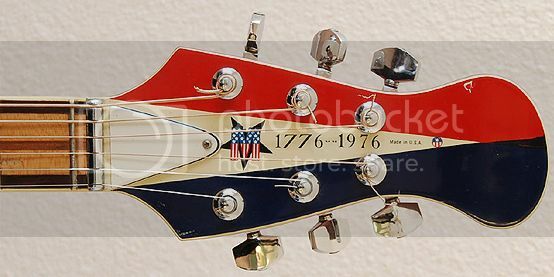 For those outside of the USA, that's America's bicentennial being celebrated, not Mosrite's own! The headstock shape on this guitar is interesting too, and is a departure from the shape with the M cutout that we expect to see on a Mosrite guitar. Anyway, speaking of anniversaries, I've managed to miss ours again! Indeed, last Tuesday was the 10th Anniversary of the Guitarz blog - the world's first and longest running guitar blog! I had earlier in the year planned on making the announcement with quite a fanfare, giveaways, competitions, etc etc, but the brutal truth of the situation is that I am absolutely broke and simply can't afford the extravagance. I had hoped to produce a Guitarz calendar for 2013 too, but again I really can't afford to do so. Sorry for the sob story... All I can promise is that I hope and fullt intend to continue bringing you a daily dose of weird and wonderful guitars for as long as I am able. Enrico Piretti was a famous Italian luthier active from the 1950s to the 1990s, and mostly renowned for his violins and classical guitars - though he also built some electric guitars such as this almost strange archtop with its claw-like cutaway. Unfortunately I cannot tell much more about this guitar and its maker, all I can do is offering this picture to your admiration.